A set of four individual 4x6” greeting cards featuring some of my original photographs showing the colours you would find at the park, looking at trees, at the beach or during a mild sunset. 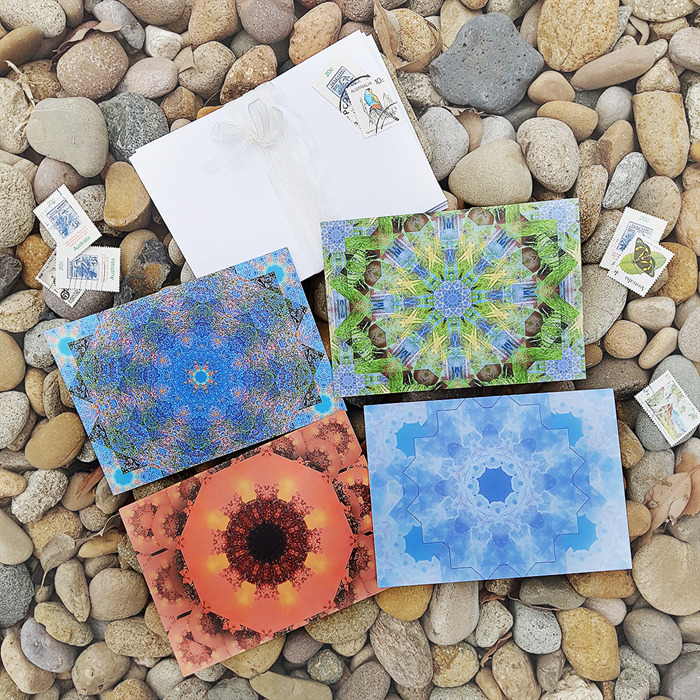 These original photographs from the 'Outdoors' have been digitally modified to imitate the rotational symmetry we can see when looking through a traditional kaleidoscope. Perfect for everyone with a love for quirky art or science. 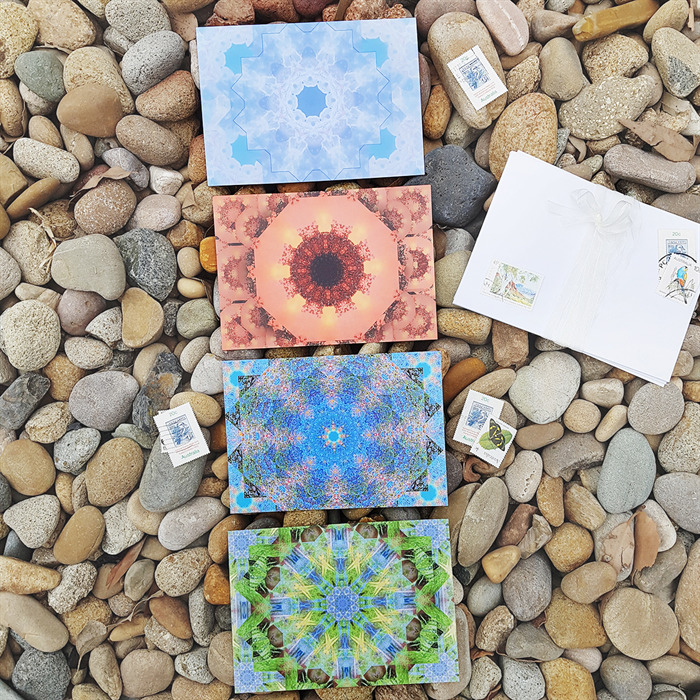 Each image is printed on thick 340gms sustainably sourced card stock. The outside is satin coated for excellent colour reproduction and the inside is left uncoated and blank for you to write your own message. Each card and standard size white envelope comes in a plastic sleeve for added protection. 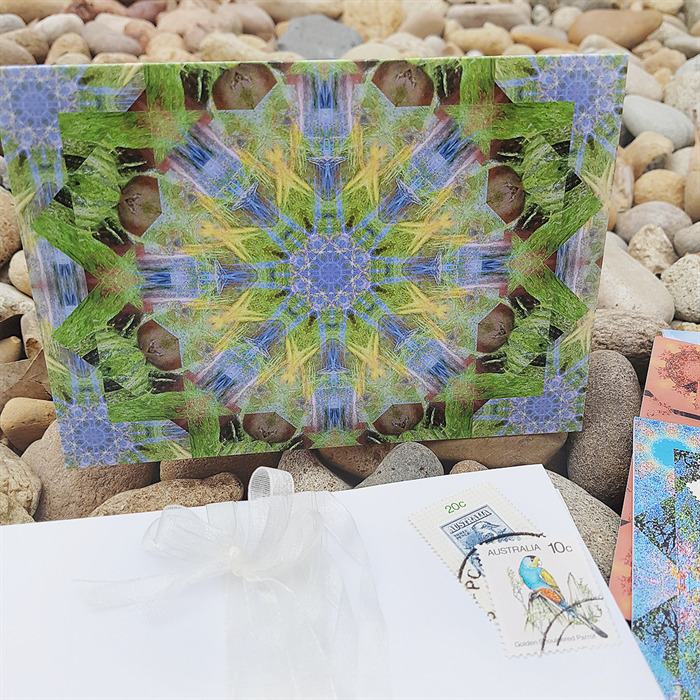 Send a truly special message to your friends and loved ones with these unique cards at less cost than many store bought cards. 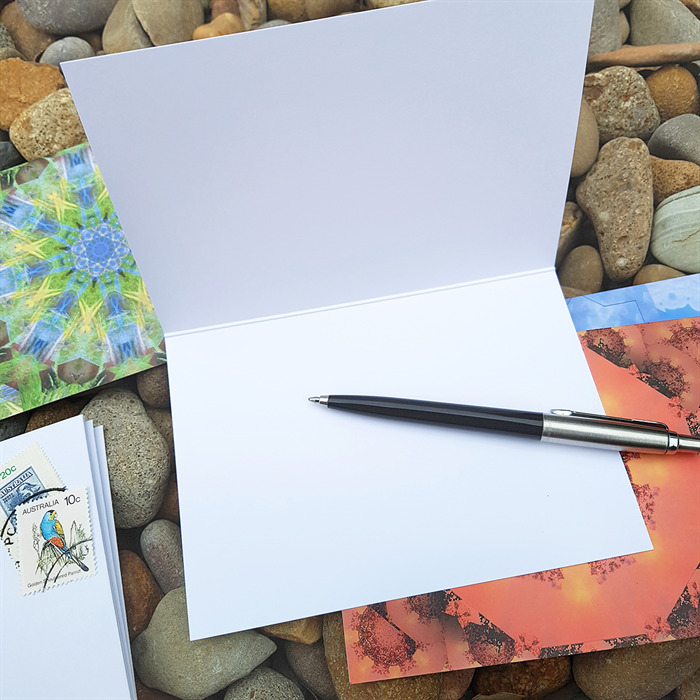 They also are the perfect gift for anyone passionate about card writing and snail mail. Please note that postage for this listing is free for standard Australia Post delivery. Your order will be dispatched within 1-3 working days. Please note that on-screen colours may vary slightly to real life prints. All original designs of az pictured are protected by Copyright. All rights reserved. Please join me on Facebook - Pinterest - Instagram to find out more about my work. Payments are due at the time of purchase. Please leave your full name or order number as reference when making payment. Items will be posted within 2 business days of receiving the cleared funds. Local customers are welcome to save on postage and pick-up items from my studio. Please contact me for a Free Postage Coupon Code. Positive feedback is much appreciated. Thank you for your purchase.